ROBERT Lewandowski has put an end to speculation linking him with a move away from Bayern Munich, saying his heart belongs to the club. 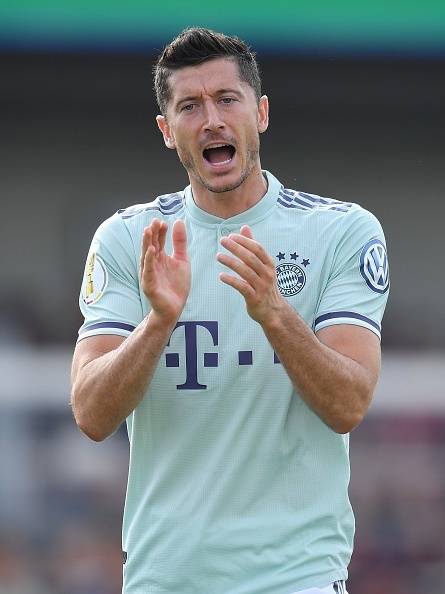 Lewandowski, 30, was linked with a host of European sides over the summer, but after sitting down with new head coach Niko Kovac and sporting director Hasan Salihamidzic, he quickly made up his mind to stay at Bayern. “I had a really good discussion with Niko Kovac,” said Lewandowski last season’s top Bundesliga scorer with 29 goals. “I realised how important I am for Bayern and they weren’t going to let me leave,” he explained. It goes without saying a happy Lewandowski is good news for Bayern. Since moving to Munich from Borussia Dortmund four years ago, he has scored 155 goals in 197 appearances, helping Bayern win four successive Bundesliga titles – the DFB Cup and three Supercups in a row. In his first two outings of the 2018-19 campaign, the Warsaw native has already struck four times, following up his 33-minute hat-trick against Eintracht Frankfurt in the Supercup with the match-winning goal against Drochtersen/Assel in the DFB Cup first round. “I prefer to answer critics on the pitch,” Lewandowski continued, touching on the disparaging remarks he faced after failing to find the net in Bayern’s 2018 Uefa Champions League semi-final defeat to Real Madrid. “People can criticise me for not scoring, but not for lack of effort. Last season I had a patellar tendon problem for seven months. I could hardly shoot with my right foot, always avoided it in training and would just struggle through the pain in matches. I had to battle more against my own body than against opponents. Bayern begin their 2018-19 Bundesliga campaign at home to Hoffenheim tonight.